Voodoo doll love spells are the rituals that most people associate with Voodoo, even though this type of magick is just one aspect of Voodoo practice. The idea is that you create a doll that is connected to a person, and you perform a spell or ritual on the doll to represent that person. It's a common enough idea in spellwork, though Wiccans usually use the term "poppet" instead of "Voodoo doll". You can use such dolls for many types of work, but this page is specifically for a Voodoo doll love spell. This is a doll spell that is used to make someone to fall in love with you. Wiccans or other Pagans may not appreciate this style of magick, but it is perfectly acceptable within Voodoo. The doll can be carved from wax, molded from clay or sewn from fabric. A hand-made doll is much more powerful than a store-bought object, so take the time to do it right. Add in the items from their body, using hairs, nail clippings or at least a bit of fabric from clothes they have worn. Also use the same items from yourself. Write or carve his/her name into the doll as well. Write your beloved's name on the paper and leave it on the altar. Set the doll on the paper and snuff out the candle. The next night, light the candle again and pick up the doll. Again, set the doll on the paper. This time, leave the candle burning for at least an hour. The person you want will soon show some interest in you and quickly fall in love. When your spell is successful, wrap up the doll and put it somewhere safe to keep the attraction going. 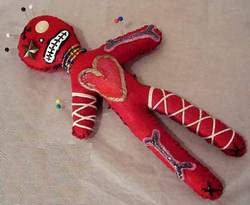 This is one example of a good Voodoo doll love spell, and it doesn't even have you sticking any pins into it. Leave the Voodoo Doll Love Spell page and return to the main Voodoo spell page.